Main Street Delaware Chocolate Walk was a tasty experience. The $20 ticket entitled visitors to visit downtown businesses and receive a treat at each one. Each business thoughtfully prepares a chocolate treat to sweeten the experience in a unique, yummy way. The tour began at 20 E. Winter Street on Saturday, February 10 where vistors received a tour map and a goody bag for toting their chocolate, that which the didn’t eat right way, that is! The tour is self-guided and ran from 12 p.m. until 6 p.m. 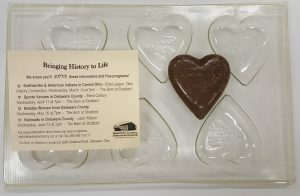 The Delaware County Historical Society supports Main Street Delaware and participates each year in the Chocolate Walk. We had volunteers in the Hair Studio from noon to 6pm, in shifts. 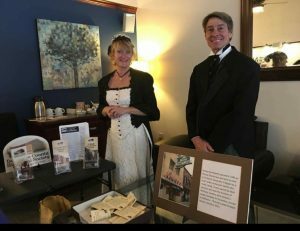 Our display presented information and photographs of historic downtown Delaware and, of course, some chocolates made from antique molds in our collection of Delaware memories. We had volunteers in The Hair Studio from noon to 6pm, in shifts. Shown are Charlton & Roxanne Amidon who volunteered for the 2pm to 4pm shift. First Friday was inspired by the days when my Grandmother and her friends would come into downtown on Friday nights for an evening out. They would take in a movie, have a hamburger at the Hamburger Inn, stop for a soda at the Dime Store and spend time with friends, making memories.